This is a guest blog I wrote for Climate Progress and Skeptical Science. You may use it as a new open thread to discuss the cracking event. I will try and do a more detailed winter analysis in April, if Allah and time permit. The sea ice cap on top of the Arctic Ocean is often imagined to be a monolithic, continuous sheet of ice floating on water. A closer look quickly shows it is rather a collection of larger and smaller pieces of sea ice. Of course, we have all seen the images of ice floes separated by open water during summer, but even during winter the ice pack gets fractured, leading to leads that quickly freeze over again. This explains how from the 1950's onwards submarines were able to emerge at the North Pole (the image on top is showing the USS Connecticut as it surfaces in the Arctic Circle on March 19th 2011; copyright: Kevin S. O'Brien, U.S. Navy). The subs couldn't break through the thick ice and had to look for a lead where the ice was thinner. Strangely enough those who deny the reality and potential consequences of AGW still like to abuse this event and claim it somehow proves that nothing unusual is happening up North. It doesn't prove or disprove anything, as cracks and leads have always been a normal feature of the Arctic sea ice pack. But 'normal' is a word that has become less and less applicable to the Arctic in recent times. The 2012 melting season was the latest climax in a series of record years, that showed conclusively that the ice is thinner than it has been for a very long time. Ice, however thin, doesn't fracture by itself. It needs wind to pull the ice pack apart. This wind was provided by a big, intense and stubborn high pressure area that started about a month ago and kicked the Beaufort Gyre into action, which is an ocean circulation pattern that transports the ice in a clockwise fashion from the North American coast towards Siberia. Aside from the red circle showing the start of the cracking event, there is clearly another big difference with previous years (blue rectangles). At the end of the previous three freezing seasons some of the multi-year ice in that disappearing safe haven north of Greenland and the Canadian Archipelago was transported into the Beaufort Sea. This buffer zone of thicker, older ice actually prevented an ice massacre in the 2010 and 2011 melting seasons, but unexpectedly didn't stand a chance in 2012. That means that this melting season there is no buffer zone on the Pacific side of the Arctic. On top of that there is this cracking event, the effects of which are difficult to predict. Even though sea ice extent and area have reached their annual peak and temperatures aren't as low as they used to be, it is still quite cold in the Arctic. The labyrinth of leads that stretches all the way to Greenland due to another intense high pressure area, is freezing over again with a thin layer of ice (see image on the right showing the LANCE-MODIS March 21st satellite image). A possible outcome could be that when the Sun starts to beat down on this part of the Arctic from May onwards, the thin ice will quickly disappear leaving behind stretches of open water well inside the ice pack. Under the right circumstances this could significantly accelerate melting. Never mind the fact that the ice pack has started to break up in ever smaller parts so early in the year, making it much easier to move the ice around. The weather map across the Northern Hemisphere features a sprawling and unusually strong area of High pressure over Greenland that is serving as an atmospheric stop sign, slowing weather systems as they move from west to east, and allowing storms to deepen off the eastern seaboard and tap into more cold air than they otherwise might have. That is not your typical fair weather area of High pressure, either. Some computer models have been projecting that, sometime during the next couple of days, the Greenland High could come close to setting the mark for the highest atmospheric pressure ever recorded. The blocking pattern has helped direct cold air into the lower 48 states as well as parts of Europe, while the Arctic has been experiencing dramatically warmer-than-average conditions, particularly along the west coast of Greenland and in northeastern Canada. Blocking patterns are often associated with extreme weather events, from heat waves like the one that occurred last March, to historic cold air outbreaks and blizzards. As can be seen on the image in the lower right corner, temperatures in the past three months have been anomalously high over Greenland and Baffin Bay, where sea ice area has already started to drop. This doesn't bode well with last year's events in mind, when almost all of the Greenland Ice Sheet was melting at one point (something which allegedly only occured once since the Holocene Climatic Optimum) and wild streams washed away bridges and heavy machinery, culminating in a record yearly amount of 570 Gt of melted volume. Although the melting season has now officially started and sea ice area/extent has begun to decrease, the ice will thicken some more until the Sun takes over the entire Arctic Circle. Perhaps weather conditions will be mild, gigantic cyclones leave the ice alone, and the ice turns out to be sturdier after all. But given the current status a new record is a very definite possibility. It's not for nothing that we are entering the period that according to Wieslaw Maslowski's model could see an ice-free Arctic (sea ice area below 1 million km2) for the first time in a very long time. This will probably have consequences, if they aren't already upon us. Which aided the Arctic Ocean gyre to turn its usual way. Since the sea ice was so thin and likely the surface temperatures not as cold as it should have been, the ice was mangled. Pretty much like Dr Barber suggested way earlier than usual. Its important to be precise considering descriptions of major events. Another glimpse of the recent past on March 3, with respect to High Pressure hovering above the badly broken ice, at the temperatures of that day , it took very little time for any lead to freeze. The way to judge a lead age is by how fast it disappears under a cover of snow. http://eh2r.blogspot.ca/ Most of these just frozen leads are not that old. Furthermore the lack of compression disappearances indicated thinner ice not laced with large pans of multi-year ice. The fresh new lead ice was able to withstand greater lateral pressure. Unlike new leads amongst older pack, many persisted till this day. You have vastly more experience in these matters than I. What do you suppose the fact that "the lack of compression disappearances indicated thinner ice not laced with large pans of multi-year ice" portends for the forthcoming melt? N.B. I just stumbled across this "open" paper from Geophysical Research Letters entitled "On the 2012 Record Low Arctic Sea Ice Cover: Combined Impact of Preconditioning and an August Storm"
"Keeping track of Arctic cyclones in future summers might help elicit further insights into the rapidly declining Arctic ice and help resolve the puzzle of why many climate models have not predicted sea ice declines as fast as what the satellite observations reveal"
Hi Jim, it means exactly like what Neven has written, black ice melts faster under the sun, gyre ice flowing will never stop dead as it did in January, instead will pick up speed. 2007 repeat with much thinner ice would create a greatest melt ever. At beginning of 2013 yet again the conditions were not ideal for for a total melt down. Weather over the Arctic Ocean was relatively clear this winter, favoured greater ice accretion, but if these conditions persist sea ice great melt will occur very rapidly, if clouds cover up the Arctic from now on expect a 2012 scenario repeat but with no ice at the Pole come September. Otherwise, only If La-Nina trends again. Again as with recent years, extraordinary how ENSO trends towards El-Nino starting a few weeks ago, making greater cloud coverage the saving grace of sea ice once more. The opposite ENSO sequence - El-Nino during winter and La-Nina at Spring - was in 2007, yet summer melts since 2007 continued albeit slower than it can potentially be under clear June and summer skies. A new satellite passive microwave (PMW) melt onset retrieval algorithm based on temporal variations in the differences of the brightness temperature between 19 and 37 GHz is shown to be as effective as radar (e.g., QuikScat) measurements. The PMW technique shows improved melt estimates that are more closely linked to observed snow-off dates than previous studies. An integrated pan-Arctic (north of 50°N) melt onset date (MOD) dataset is produced by combining estimates on land and sea ice for the entire satellite PMW record. During the 1979–2011 period, significant trends of 2~3 days (decade)−1 to earlier MOD are mainly concentrated over the Eurasian land sector of the Arctic, consistent with changes in spring snow cover extent observed with visible satellite data. The variability and change in melt onset are largely driven by spring surface air temperature, with insignificant influence from low-frequency modes of atmospheric circulation. Apologies if this has been posted previously. Thanks Wayne, and thanks DNA also. Very interesting closeups of the "much thinner ice", not to mention the odd bit of "open water". The buoys deployed by the Polar Stern at the end of last summer (in the Laptev or East Siberian sea?) have already reached the north pole. Was the deployment position chosen so the buoys would be perfectly situated for the start of melt season? Does anyone know if there is a webcam on any of those buoys and if so if there is a public URL to see them? Jim, thank you for the link to arctic storm paper! Has anyone investigated the impact(s) on sea ice by sea spray aerosols formed during these storms? On more thing, Arctic methane is hitting record as well. 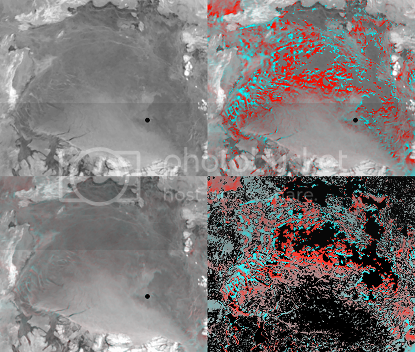 I have updated the METOP 2 IASI CH4/methane imagery. There is significant widespread methane at 586 and 718-742 mb in the Arctic. An example is below for March 21, 2013 pm 586 mb. I still have to add the March 23 2013 pm images. As far as I am aware, we are looking at record methane in the Northern/Arctic atmosphere for March. The Antarctic also has high methane as well. Simply awesome post there, Neven. Bet your wife never dreamed when she married you that someday you would be writing the lead article at Joe Romm's! Here are the older QuikSat radar animations or the years 2006-2009, from 01 Jan to 30 May f. (Recall 2010-2013 were posted earlier.) The intrinsic resolution of QuikSat is lower than Ascat so I could only bump the resolution up to half-width (205 pixels) without encountering pixellation. They run synchronously at 100ms per frame but with ~1000 ms at the initial and final frames depending on satellite drop days. The multi-year ice -- and its movement -- has some similarities from year to year but overall things were rather different back in earlier years. While quantitative comparison of cracking seems infeasible, 2013 is clearly without precedent in recent years -- including the big melt year 2007 - as the ice only got thicker and stronger prior to that. Again congrats on a superb post. Linked it in my most recent blog. Huge chops to get rec from Joe Romm and Skeptical Science. What strikes me about these earlier years is how slow and stable the ice pack is. The MYI looks enormous compared to now. It seems at the mercy of just about anything at the moment: wind, high pressure, low pressure, the Gyre. You name it. Did you notice that low churning up ice in The Sea of Okhotsk? The navy.mil thickness animation shows much of the ice there turning into a big swirl. Another excellent A+ post Neven. 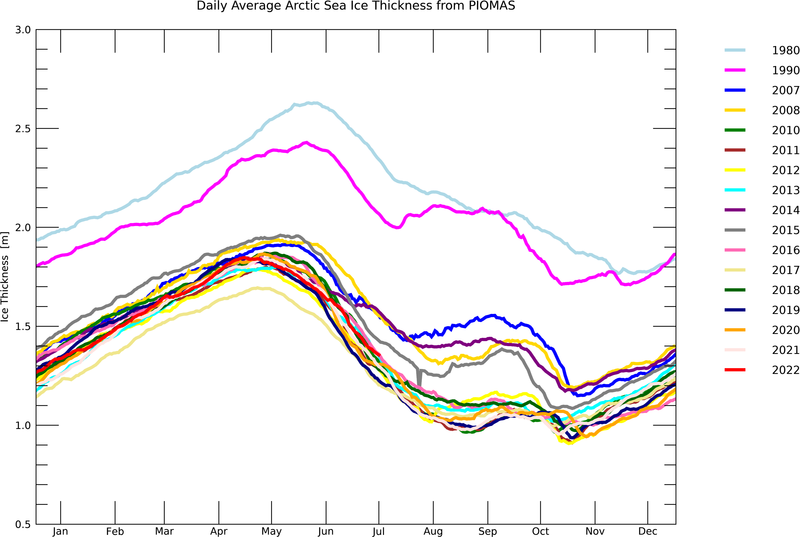 We can anticipate that the peak of the average thickness will occur during the week of April 20-25 or so, as the thin ice melts out early and raises the average thickness until the real melt season sets in. The timing and level of this peak average thickness will be a great clue for strength of the upcoming melt season. Request a copy from the corresponding author, Jim. Normally they're happy to respond. That may help a little, but it can't be a complete answer or IMO even a major piece of the puzzle. We need to be able to explain why mid-Piacenzian Arctic temps (~3 mya, the last time CO2 was ~350 ppm) were 18C +/-4C greater than present (with global temps ~+3C). Added cyclones aren't going to do that, especially as other results are pointing toward less of them going into the future (mainly due to a decline in baroclinicity IIRC). IANAS, but I think the answer has to be a major reorganization of of ocean-atmosphere circulation, probably combined with a drop in the thermocline to retard heat mixing down. The answer can't be permafrost, methane or ice-albedo feedback (not to discount the prospect of those having large effects in the near future, and in the present in the case of ice-albedo) since the mid-Piacenzian was more or less at equilibrium and since the prior Zanclean period was only a little cooler globally. I know people are working on this problem and there are some proposals as to mechanisms (one being a massive increase in tropical cyclones), but I have heard nothing about any firm results. The only thing that seems clear is that a whole bunch of heat gets transported into the Arctic, somehow. Thanks for the compliments, everyone (ego swells with pride). I don't think the piece is particularly good, but I cover most of the issues, and the news value is high, of course. Neven, it's good because you DO cover most of the issues. The comprehensive nature of your posts is what gives them news value and elevates them to a "must-read" for those of us who study the Arctic. 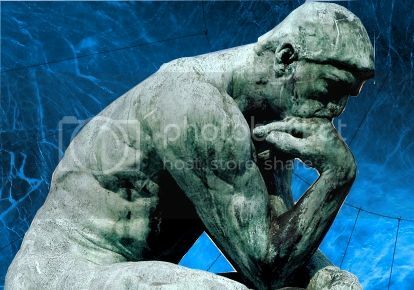 It's okay to let your head swell here a bit as you obviously have passion and care deeply about the content. That passion and excellence has attracted others who also have excellent insights to add, making this blog as the "go to" place on the web for all things Arctic. Thank you! "... and the news value is high, of course." Visitation (aka educational outreach) must be exploding -- I got a server-overload message the other day about my stored images from the cloud provider. The message being, you gotta pay from here on out. Not too bad though, 8 pennies a day. Paul, I might hold off on putting together the ultimate crack animation in favor of a whole season "documentary" -- too much happening right now. The dramatic sweep of black storm clouds might better be left in. Anybody know what has happened to the Ascat METOP-Aserver ... seems like it has been down for days. Is there an alternative site? I would hate to lose the time series. Wow ... a lot to think about already on this thread -- thanks everyone for the ideas and resources above. 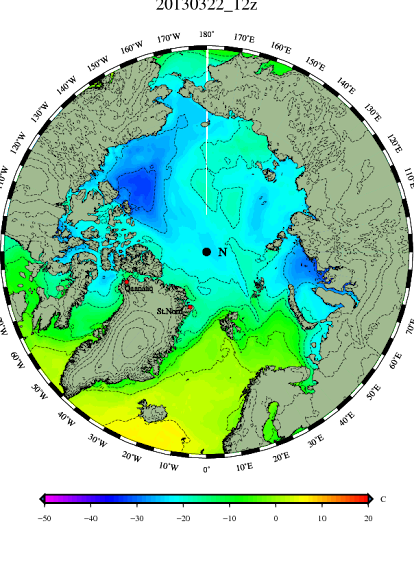 Likely, the area of deep water formation at the north end of the North Atlantic Drift (NAD) moved into the Arctic Basin and the NAD carried heat into the Arctic. Steve, in addition to NAD mentioned by Aaron changes in the number and strength of SSW events could deliver heat in large quantities. Not sure how that could be determined except by impulses of warm loving foraminiferal (foram) species found in ocean floor sediments. Fast Impulses of cold to warm and then back again would be a good indication of atmospheric influences on foram populations. Does anyone know the timing of Mediterranean/Atlantic disconnects. I'm thinking that lack of Mediterranean salt dense water flowing into the bottom of the Atlantic could drive NH changes in deep sea convection currents. If anyone has knowledge of sampling that could throw some light on this subject? A-Team/Brian - 20th and 21st still seem to be missing? I got a server-overload message the other day about my stored images from the cloud provider. The message being, you gotta pay from here on out. Not too bad though, 8 pennies a day. One thing I noticed, is that your animations are big. Does Gimp allow you to make them less bulky? I try to keep them small after some folks complained that it takes ages for them for the page to load. But most people have broadband of course. Yes, Ascat Mar 20-21 still missing. Satellite malfunction, glitch at receiving station, lost misplaced files associated with server malfunction? I wrote NOAA's Paul Chang this morning to see if he could located Mar 20-21 for us. We do like our complete time series around here. These Ascat images are very convenient for down-to-the-last-pixel ice sheet deformation studies because they arrive perfectly co-registered (unlike the avhrr) and have good-enough resolution. I posted an example a couple months back of a clever Petermann glacier motion study with Modis. Party unknown took 3 widely separated dates and composed a color image taking the 3 grayscales as red, green and blue channels. Since the glacier, calved floes and melt zones moved whereas the landmasses did not, this highlighted very slight changes via color fringing effects. I think this technique will be quite revealing with ice pack motion as well. That is, take 23,24,25 Mar as the 3 grayscales, make them RGB color. That's one frame of an animation; repeat for a whole season or multi-year. Gimp does channels quite poorly but this is available under Color -> Components -> Compose/Decompose. The image will still be gray where no motion took place and colored according to rapidity of motion elsewhere. The gray can then be dispensed with by passing to HSL color space, leaving a quantitative picture of what is moving where how fast in what direction with what linear and angular momentum. Since we have 4 years of the Ascat sensor, this allows inter-year comparisons of ice mobility. Thinning no doubt has greatly increased elasticity and mass loss enhanced movement in response to inertial forces. Here I took 3 Ascat images with 3 day spacing. Upper left shows day 78 of 2013, lower left (r,g,b) = (day 78, day75, day72) looks like a 3D movie without the glasses, upper right pulls out the colors as an overlay, lower right the movement colors by themselves. According to this, most of the motion was taking place in the Beaufort Gyre and thinner ice. "Under the harsh winter conditions of the north-western Atlantic Ocean, surface water in the Labrador Sea mixes with water from deeper layers to form a homogeneous water mass known as Labrador Sea Water (LSW). The amount of LSW formed displays a large interannual variability with a depth of convection ranging from only 200m to over 2000m depth. In order to understand the driving mechanisms behind this variability, we need to understand how the ocean and atmosphere drive and limit convective mixing in this region. I will zoom in onto two aspects that are important for convective variability: (1) the roles that three different mesoscale eddies play in the restratification season after deep convection and (2) the way in which the fresh surface layer inhibited deep convective mixing in the particular case of the 1969-1971 period. The first item is studied using the MITgcm model in a highly idealized regional configuration of the Labrador Sea, where we found a dominant role played by one particular eddy type. The second issue was studied using in situ data taken from an ocean weather station in the central Labrador Sea. The analysis shows that the role played by fresh water in the surface is more complicated than commonly assumed, with a feedback mechanisms which actively decreases the surface heat flux as long as deep convection is inhibited." 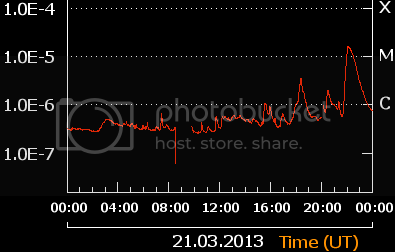 There was a M 1.6 solar flare on March 21, for which some satellites were placed in standby mode. The gap happened with the METOP 2/B imagery as well. Regarding ice motion and speed the ESA/NCOF My Oceans website also has modeling of x and y axis sea ice motion. See the ASIF comment and imagery example. The site only works with Google Chrome. Fissures and fractures have been open on and off in the Laptev, but thanks for the update and link. Looking at Navy Hycom ice thickness animation out to the end of the month, they seem to be predicting today 25 Mar 13 as the end of the freeze season, in terms of peak multi-year ice. A-Team.....According to this, most of the motion was taking place in the Beaufort Gyre and thinner ice. Well, this is good news. It suggests that, despite the cracking, the main pack of thick MYI is still fairly safe from transport out the Fram or melting out in the Beaufort. According to this, most of the motion was taking place in the Beaufort Gyre and thinner ice. Not realy, check the 10-day CICE ice motion forecast - on thrusters through the Fram. Don't know if we have an exact correlation to ice loss RE Nina/Nino (or for AO, for that matter). 2010 was an El Nino year and we had huge volume losses. No new record area and extent. But a year of volume losses equivalent to 2010 in 2013 would bring the Arctic very close to ice free. My very tentative opinion is that ocean temperature is over-riding natural variance(and not just surface temps, but overall temps in any region remotely able to mix with near surface water). Very hot surface temps and mixing likely resulted in the 2007 melt. Overall warm temps provided by ocean mixing (storm or no storm) facilitated record melt in 2012. And 2010, though it saw no record low area or extent saw record volume losses due to erosion of thick ice. Oh dear God. Steve Goddard just linked my blog... I can hear the pitter-patter of denier troll feet already. By popular demand (? ), here are four more QuikSat early years, 01 Jan to 30 May for 2002-2005 (before I forget the many glitchfalls involved in making them). Like those above, 205 pixels wide and synchronized to 16.7 seconds. While of greatly diminished relevance to the 2013 melt season, it is remarkable to see how the ice has changed over the years. I may use these later in a 'shocumentary' for the overall 2013 season, depending on how that plays out. Ok, I got the 20-21 Ascat files up with some great help from Qi Zhu at Noaa. Because there was in fact a precautionary satellite shutdown, day 79 has a scan wedge sticking into the Arctic. The earliest data they received after the shutdown was at 06:51, in particular ASCA_SZR_1B_M02_20130321065101Z 20130321065358Z_N_O 20130321071922Z__20130321074416 if anyone wants to root around in it any more. That color motion analysis is just superb. I'll be interested to see what happens over the next couple of days. The CICE motion forecast A4R mentions is right through the heart of the thick ice. Will have to see. Neven, do you have any ideas what is causing the atmospheric blocking and the deeply negative AO? Is it just greenhouse gasses or can we blame the low solar activity as well? Hans, like I say in my piece I think it could have to do with the (early) collapse of the Polar Vortex due to a second sudden stratospheric warming event. How much this in turn is influenced by AGW or solar activity, I wouldn't know. The substantial build up of heat in the oceans since 1998 combined with an insubstantial increase in the temperature of the atmosphere has destabilized the atmosphere over the oceans. I think, based on recent research results, that this destabilization has led to the rapid increase in sudden stratospheric warmings over the past 15 years. This January, convection in the tropical western Pacific ocean over the deep oceanic warm pool lifted an enormous bubble of warm air that rose up over Tibet, breaking through into the stratosphere, causing the sudden stratospheric warming. Previous year's sudden stratospheric warmings have also occurred when tropical convection was enhanced over the west Pacific warm pool. I'm still having a difficult time making sense how the jet stream, Polar Vortex and atmospheric blocking all influence each other, and where Arctic sea ice or for that matter solar influences fit in. But this weather to me is weird. Just a few days ago we had +16 °C over here in Austria. Now it's around -4 °C, but in 4-5 days it's projected to be 16 °C again. My daughter is busy feeding birds all day. BTW, NSIDC called the maximum. Well, denialists are cheering: Winter is back in Europe. Back to the topic - Any new cool animations or satellite pics of cracking ice? Thanks Phil. Reading that explanation triggered a memory of a paper I had read in the 90's about eddy formation off the SW coast of Greenland and mixing of water at depth. That piece on the polar vortex collapse is excellent. You may also look at recent work by Jennifer Francis that links blocking patterns and enhanced Rossby waves to erosion of Arctic sea ice in summer and autumn. My personal view is that this wavy jet associated with a collapsing polar vortex is certainly influenced by AGW. We have more warm air invasions from the south and more heat in the Arctic pushing cold air out. The transfer of abnormally warm air into the stratosphere from equatorial regions has also been linked to AGW. Looks like all these mechanisms are linked to Arctic polar amplification -- either as a response or as a contributor. SSW's should definitely be getting some research dollars moving in their direction. I for one want to know if the western pool water's thermal gradient has reached some cyclical equilibrium by venting extra heat directly into the atmosphere instead of via an el nino event? I also want to know the role of advection from more powerful and longer lasting cyclonic activity. Lastly, I would look for incursions of ultraviolet radiation due to breakdown of stratospheric O3 by man made chemistry preceding and/or during SSW. I would not be surprised to find that our effects are reaching both higher into the atmosphere and lower into the oceans than we realize. Robert, polar amplification is a big factor in the atmospheric circulation changes but it's still secondary to expansion of the tropics (as would make sense since the tropics are where most of the heat enters the system). Among other things, expansion of the tropics is what has pushed the jet north. Neven's link to the polar vortex article didn't work for me, so here it is again. I had seen it before but hadn't had a chance to read it carefully, so it was great to get a reminder. But far more striking than the article itself was this linked paper focusing on the role of the MJO in SSWs. I'm still reeling a bit from the first couple pages. I had somehow missed this entire line of research. Together with other very recent results on shifts in the Walker circulation and ENSO itself, it may be that a coherent picture is starting to emerge. I have lots of reading to do. Hans, a new piece appeared on The Guardian just now, where they do say that changes in the jet-stream (caused by disappearing sea ice, caused by AGW) are leading to atmospheric blocking and the extreme weather of last year and this year around this time. "This is what is affecting the jet stream and leading to the extreme weather we are seeing in mid-latitudes," she said. "It allows the cold air from the Arctic to plunge much further south. The pattern can be slow to change because the [southern] wave of the jet stream is getting bigger. It's now at a near record position, so whatever weather you have now is going to stick around," she said. Francis linked the Arctic temperature rises to extreme weather in mid latitudes last year and warned in September that 2012's record sea ice melt could lead to a cold winter in the UK and northern Europe. She was backed by Vladimir Petoukhov, professor of Earth system analysis at Potsdam Institute in Germany, whose research suggests the loss of ice this year could be changing the direction of the jet stream. "The ice was at a record low last year and is now exceptionally low in some parts of the Arctic like the Labrador and Greenland seas. This could be one reason why anticyclones are developing," he said. The heavy snowfall and freezing temperatures which have marked March 2013 across the northern hemisphere are in stark contrast to March 2012 when many countries experienced their warmest ever springs. The hypothesis that wind patterns are being changed because melting Arctic sea ice has exposed huge swaths of normally frozen ocean to the atmosphere would explain both the extremes of heat and cold, say the scientists. Thanks! Glad to get my hands on that paper. Very impressive piece of reading. I'll definitely add expansion of tropics to my list of mechanisms to polish up on. Ah, great article in the Guardian. Francis has really broken a lot of ground over the past year and a half. Good to see she's getting more MSM coverage. I discussed the "parked" weather system with a very well known local Arctic scientist the other day, and he also agreed to the findings and was very worried at the same time about what is going on in the Arctic! Well, one thought I have is that standards had to be severely bent to include Judy as a sea ice expert. Her limited publication record on the subject just doesn't support it. So Hans, my major criticism of your article is that you carried forward that premise. Oops, ignore that last, crossed Hans/Jos wire and commented in the wrong thread. Sry. I started giving presentations on sea ice connections to jet streams and extreme weather in Jan, 2012 to educate the public, well over 50,000 people have accessed this presentation that I gave to the Canadian Meteorological and Oceanographic Society back then. Once I clear my PhD comprehensives hurdle which is ongoing for the next few weeks I will focus on the publications. Remember that the Arctic June snow cover extent has declined at an even faster rate than sea ice area has; in fact much faster. So the albedo collapse is not just from sea ice. Also, the albedo has been dropping very fast on Greenland, especially since the 97% melting coverage back in July last year. Also, the equatorial temperature is fairly constant, so since the high Arctic is warming much faster the polar-equatorial temperature gradient is collapsing, thus the physics dictates that the jets must slow down and become much wavier, and thus start being dominated by ocean/land temperature contrasts which lock them into persistent patterns. Such as for Pakistan in 2010 when it flooded out (persistent L) while Moscow baked (persistent H)and lost 40% of its grain crops. Like the ongoing drought in the US SW and the bizarre patterns now. Yes, it can all be tied directly to GHG slashing the Arctic albedo reducing the temperature gradient bending the jets. This is ongoing, not just indicative of SSW events. The meteorology in the Arctic has become completely fractured, the SSW exacerbates the fracturing. Once question regarding methane? Has anyone tried to examine the satellite images for the regions where the methane emissions are the highest to see if there is any sign of bubbles. For example in the Barents sea now. Or in the ESAS region during last summer when the ice left that region where plumes 1.5 km in diameter have been reported by the Russians? It should be visible on the satellite images as very bright white circular areas. Anyone read the BAMS, November, 2012 article on the AMOC? The data shows that it basically cratered to zero (even below zero; reversing) in 2010/2011. And then jumped back to more normal behavior. I would expect the AMOC to significantly slow as the Arctic is warming like crazy from above as there is less need for as much heat transport northward via the ocean (which carries 25% or so of the heat) as well as via the atmosphere (75% or so of heat). So of course more heat is transferred to the southern hemisphere, and Oz bakes, for example. Since the temp. gradient increases around the ACC region the SAM polar vortex and ocean currents speed up and further isolate Antarctica, leading to more isolation and decreases in surface temperatures and thus increases in seasonal sea ice extent there. Remember the out-of-phase changes there, for example the ACR Antarctic Cold Reversal that occurred during the Bolling-Allerod warming while we were still in caves. Same see-saw idea. Of course the ice cap is still shedding weight as we know from GRACE since the ice is melting from below due to the higher water temperatures. I read your post with interest. Neven’s thread, diverse new posts make clear the notion that radical oceanic/atmospheric rearrangement is under anxious scrutiny. At least, I’m allocating the little time I find to get as much info on this as possible. That’s why I find the ENSO thread on the Forum interesting. I agree with the general direction of your reasoning. I’m not so sure on some details. The 25%/75% partaging between ocean and atmosphere in heat exchange towards the Pole sounds too superficial. I have the same hunch on your AMOC suggestions. I’ve been looking at the THOR YouTube pesentation, featuring Quadfasel, Jensen, Hazeleger et al. Apart from the notion that they were quite conservative on the process (IMHO), they didn’t suggest the THC/AMOC to be as variable as you mention. For your suggestions on methane, please have a look at my contribution on the ‘methane’-thread in the Forum. Like last year, there is a scintillation-pattern on the ice visible in the Laptev Sea that I can’t subscribe to methane-bubbles just like that. But I’d sure appreciate to hear more opinions. BTW I’ve been studying summer MODIS pics for the same region, but didn’t notice anything more than silt/algae swirls. Maybe the 250 m grid doesn’t have the right resolution. For now, I’m most concerned by the increasingly variable ocean-atmosphere behaviour. Right now, in the Netherlands we experience a 2 sigma cold March. The Arctic Sea Ice… hélas, I have almost ‘accepted’ that the imminent outcome is clear. We’re in times of consequence now. It is our challenge to put all confusing weirdness in the right AGW context. The coldest March here in the UK for 50 years? A lot seems to have changed at Ilulissat glacier over one year. I had thought that the ice in front of the glacier was very thick. Where did it all go? Message to brain. Check before posting. Here is what March 25th looked like for the last 14 years. The spring of 2008 looks odd because the summer of 2007 was most anomalous. Note the image is composited boustrophedonically. QuikSat radar is the source of 2000-09; Ascat higher resolution (2.5x) radar for 2010-13. In regard to methane increases and locations for high fall release, or spring fracture release, take a look at the METOP 2 imagery. It can point to smaller areas within the Laptev or ESS that may narrow the area search. The Google Earth images I post may be a starting point. Werther, I think you are on to something with the pattern you remarked on in the ASIF methane thread. We will be able to use the METOP 2 imagery in the fall as a potential indicator of areas of high sea bed or yedoma release. As always, the images depict the major change in MYI in such a short period of time. We really learn alot from viewing this output! May we could ask you to create an animation from Modis, where the calving and cleaning is shown . It is from day 80 to 84? I reverse-engineered the daily uni-bremen sea ice concentration map with much difficulty. It amounts to simply taking the pink off the Jaxa-Ijis color radar, which in turn represents 3 clicks of the mouse in an image enhancement program. Or rather, this is what they should be doing -- note the near-perfect match but with some omissions at their end. They may be using Ascat because it gives a longer time series. I'm not certain what they mean by 'sea ice concentrations' below 100%. It is clear from 250m Modis, its AVHRR infrared temperature, and Jaxa-Ijis southern open water that the pink does not represent open water in the sense of ice floes with liquid water between them. Indeed the ice is two meters thick in the pink regions, according to the Navy, so we don't seem to be talking about frazil, grease ice, slush or nilas either. And air temperatures seem too cold for diurnal surface melt ponds. Yet the daily creeping pink on color radar is definitely indicative of some early stage in melting, possibly related to salinity. Great work on all available data. I once posted something like ASCAT doing 'moisture content'. That seems in some way to back up with a suggestion on salinity. That said, we're entering spring with 1.7 Mkm2 'white ice', in my own words 'a remnant cohesive pack'. Not completely MYI though. It's the part that will be decisive come August. The North Pole is in grey ice; could well be icefree this summer. Here is a double animation animation of Jakobshavn Isbræ / Sermeq Kujalleq / Ilulissat Icefjord based on Modis 1km resolution imagery. I'll let you copy to the forum as appropriate. The second animation repeats the first but makes fuller use of color space ('Equalize') and inverting the gray component only ('Invert value'). It is also very instructive up at Nares. Maybe it's just me, but March 2013 looks a lot like May 2012. 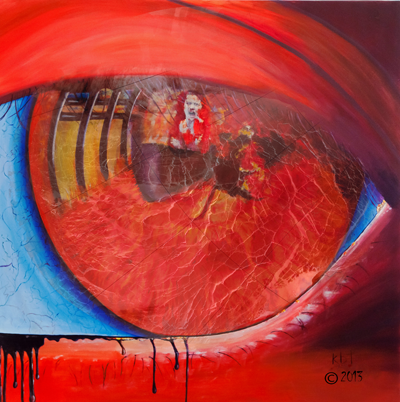 Another piece of "Art inspired by the disintegration of the Arctic Ice Cap"
With no apologies to anyone other than herself, Kasia Turajczyk's "In the Bloodshot Eye of the Beholder"
Ok Jim H, this means war. Or you could sell them at http://www.redbubble.com/ and spend the money or support this blog. Just putting 2000 and 2013 side-by-side is a pretty stunning comparison. RE Jakobshavn Isbræ / Sermeq Kujalleq / Ilulissat Icefjord. Can't stop watching that calving event near center screen. 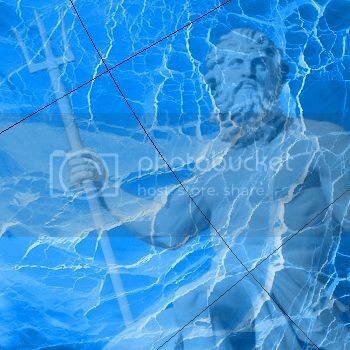 And the war of ice crack iconic image overlays is on! >"Maybe it's just me, but March 2013 looks a lot like May 2012." 48 day difference you picked out looks about right to me, good comparison. Definitely less snow on the lower slopes now than 48 days later last year. More advanced in May for some sea ice but similar for others areas. It has been warmer than normal in this region and if we picked Kara which has been colder, the sea ice looks more solid. Still 48 days ahead is a lot! Just looking at these cracks north of the New Siberian Islands. That 586 mb comparison between 21 Mar and 23 Mar is pretty stark. "A long, cold, lonely winter..." as George Harrison once sang. For the Arctic this year, it was "two out of three ain't bad." Wanderer - As luck would have it Kasia's original painting is already available via RedBubble. 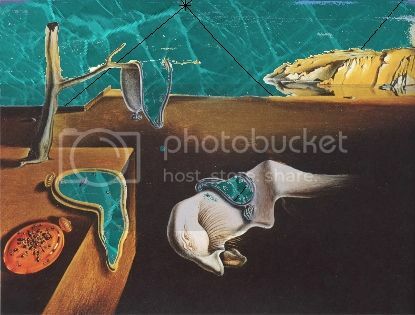 Would anyone here part with good money for some good causes if the "Beaufortised" images were made available there? Actually I think RedBubble would make most money on any sales! Anyway they would be great to raise awareness of the ice melt! "Indeed the ice is two meters thick in the pink regions, according to the Navy"
You probably should not place much analytic weight on the Navy thickness charts. The purpose of these charts is primarily navigational, so the main focus to to capture maximum thickness that may be encountered over a broad region. Similar to Aviation sectional charts, but for Subs. Indeed, the modeling is very simple, depending on predicted winds, and historic forcings from 1980. Think worst-case situation, when you're responsible for a $3B strategic asset. The Navy could care less about asset cost ... other people's money. The operational issue here is whether the crew would actually launch a nuclear missile underwater based on a flimsy ice model overhead or just set the captain out on a floe. Whether it is 2.5 or 1.5 meters thick, that's a long ways from floes or slush in open water (Bremen sea ice concentration?). However the freeboard is minimal either way, six inches. Modis is not showing open water nearby, so salinity would not be coming in from Arctic Ocean waves or wind (note however Greenland summit cores have readily measured sea salt). So it must really come down to small brackish channels created from salt extrusion during freeze-melt cycles, now seasonally expanding to the point their dielectric polarizability is showing up in the radar return, a prelude to outright melt. Alex, here is some mid-May 2013 imagery from a new forward-looking defense satellite with mythological-sensor channel augmentation. 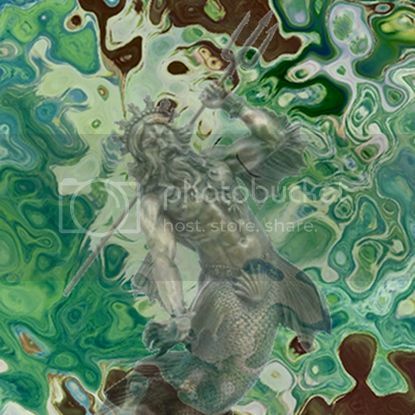 It shows Poseidon quite upset with how the Arctic Basin melt season is going. This might be pushing the melt envelope a bit but it looks like there has been a retreat of the Nares sideways ice arch over the last week. The direction of retreat seen on Modis visible has support in two AVHRR infrared channels, where darker colors indicate warmer ice and perhaps indicate the location of the next round of retreat. Check out the latest IR from Env Can. Is this what you were looking at Chris? NASA Worldview yesterday. Banks Island just visible at the bottom. Click the image to explore further afield. No I was just looking at the general view of the ice, that's a broad shot without much cloud that shows the situation clear across to the Siberian region. How much longer will it take before a sun from a clear sky will be able to warm the waters of an open crack, or a polynia, in the Beaufort so much that it is unlikely to freeze over? In recent years, any openings forming after the middle of May do not refreeze again. Openings forming earlier than mid-May often do freeze back over, but if this happens very late in the season, the ice will be thin and nearly transparent, so will melt very quickly once the season gets going. The cracks we had opening up in February and earlier this month have plenty of time and plenty of cold temperatures to freeze over, so expect them to act more or less like any other first-year ice would this season. The cracking event has essentially run its course (there's nothing left to fracture!) so I finalized an 'anatomically correct' animation of Jaxa-Ijis color radar that emphasizes directly observed, theory-free ice structural classes. The enhancement rotated the original image by 135º, cropped to the Arctic Ocean, rescaled to our 415 pixel width, decomposed RGB to CYMK, converted the cyan back to RGB and adjusted its hue, saturation and brightness consistently across all frames. It runs from 01 Feb 13 to 27 Mar 13 at a 160 ms frame rate. No restrictions on use. It might be time to consider how best to compare onset of melt season from year to year. Although the conservation of ice structures such as the goat's head for 3-4 years argues for considerable persistent memory of multi-year ice structure, it's fair to say that only where 2012 left things has much relevance to this coming summer. Recalling 2012 was a record melt year and that Beaufort fracturing happened but ~50 days later than this year, it would be good to substantiate that other melt season markers -- even an extra ~20 days would be huge increase over what has been ~100 day melt season. Sea ice area, extent and volume have been thorougly explored in this regard elsewhere on this site. Again, the most relevant year is 2012 -- longer time series provide some context but steeply diminishing predictive relevance. Nares Strait is problematic because of persistant cloudy weather -- neither visible nor infrared can penetrate these clouds. Radar imagery can, but has only borderline resolution at this scale. 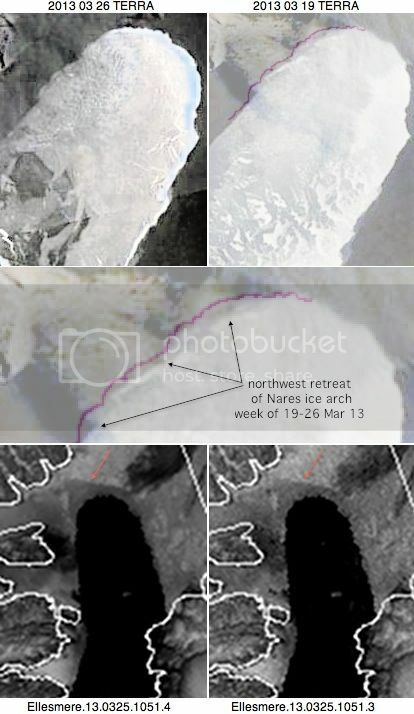 Nares has some interest because a precise fail-date of the ice arch might be observable. (Extensive past records already exist.) However as of 28 Mar 13, the ice arch has not failed. Consequently, it does not as yet provide any calibration for this melt season. Mean air temperature? Cloud cover? Below-ice water temperature and density (measurable from satellite?). In summary, I dunno. A-Team- great animation and description of how you got there. Some of us are looking to animate more and it helps that you did this. How will we know if the Nares Straight ice bridge has failed? What instrument are we looking at to signal this event? Craig, that's great to hear more people are picking up animation. I can do them in my sleep now -- some groggy mornings it feels like I must have been. They are a great way to present time series but are under-used in journal articles because some are still printed. And a lot are circulated as pdfs (I'm thinking animations are not supported there). But the web is a better way. I would like to put in a date and time stamp on every frame; in theory, script-fu could do that if supplied with a text list, location corner and font/size. The images usually come with an embedded time and instrument stamp but it is in a different location for each satellite and often in run-together format; the clone tool works but only one frame at a time. In some cases, the file name itself is sensible and would work if parsed out. The other issue is co-portability of accompaning explanatory text. At this point they are not tethered. I suppose a couple of very slow text frames could be added at the front or end but better as mouse-over popup or animation branching. I've not seen a computer platform with a contextual drop-down menu offering control of frame rate. Aside from the fracturing, there are two other significant things I notice in A-Team's animation. One, the movement of a large area of thicker ice into the Beaufort Sea and toward Alaska. Two, the fast transport of thicker ice toward and through Fram. These two things have combined to spread the thick ice out over a larger area and make it "longer" from left to right. My thoughts are that if we get similar melt in the Beaufort this year as we did last - the cracks filled with thinner ice may contribute to this - combined with the large transport through Fram, then we could lose a lot of thicker MYI this year.